iKlip Grip Pro has a large ergonomic (a fancy name for “designed to actually fit in your hand”) design that is comfortable and really “fits” your hand. The new larger grip is perfect for stabilizing video and capturing “blur free” photos, especially in zoom modes. And while the base for iKlip Grip serves as a sturdy, steady handle when you’re at a concert or trying to grab the perfect shot of the band for your facebook feed, it also transforms itself (with a little help from you) into a compact tabletop tripod you can position on any relatively level surface for ultra-steady media gathering. The trick lies in its ingeniously designed locking handle — when closed and locked, iKlip Grip Pro is a handle suited for most “handler” tasks like selfies or ultra-steady video shooting on the go. But when unlocked, the handle magically transforms into a firm and sturdy tabletop tripod that is ultra-secure and steady. 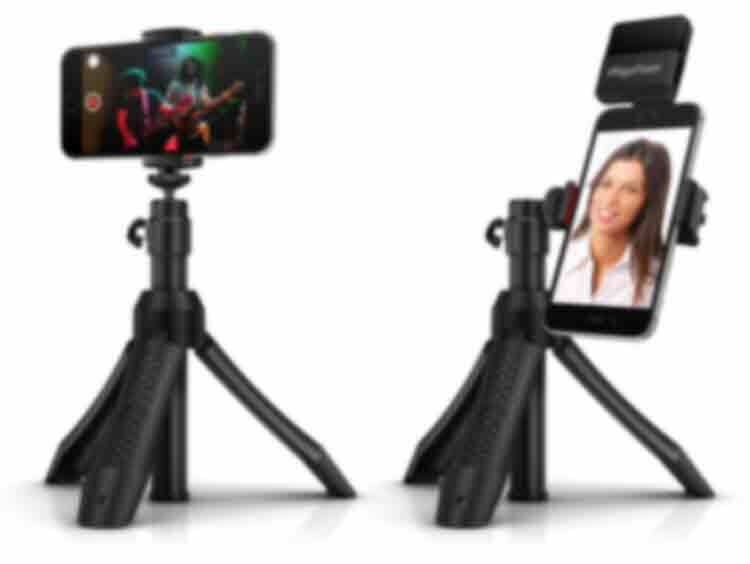 In tripod mode, you can easily shoot steady video and photos from a single location, or use the front-facing camera for hands-free FaceTime™ with your friends or live broadcast. 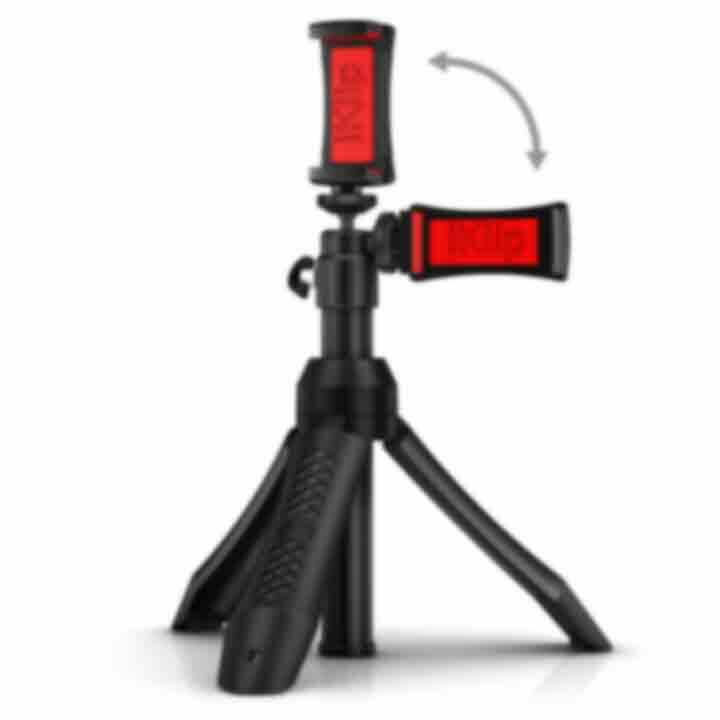 All you have to do is fold the legs out you’ll have a nice tabletop tripod for your video chats, Facebook Live, SnapChat or Periscope productions. 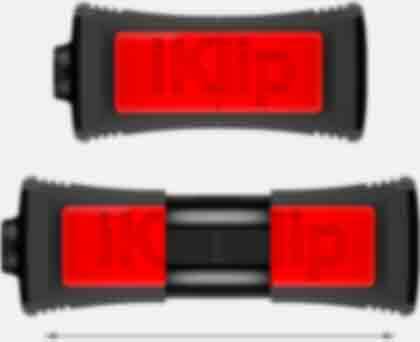 iKlip Grip Pro also features an integrated ultra-stable, locking 4-segment telescopic extension pole. At any time you can simply unlock the pole and extend it to your desired length, up to a max of 62 cm (24.4"). And since the pole is integrated into the design, no additional assembly is required — it's always there and ready. The pole extension is perfect for the distant “selfie”, but also ideal for getting “above the crowd” for audience-less band shots, closer-than-they-appear shots and anything in between. The extender also works in tripod mode so you can position your iPhone at the perfect distance above the table top. Plus, iKlip Grip Pro has a pivoting ball-joint attachment point that positions your phone at a full 90° angle adjustment plus 360° rotation capabilities. This allows you to get just the right angle and position for that perfect shot. iKlip Grip Pro comes with an integrated yet removable Bluetooth smartphone shutter remote control that lets you remotely activate the shutter button in video and photo apps. A holder clip on the handle lets you use it as a thumb-activated shutter control, or when using iKlip Grip Pro as a table top tripod, you can easily detach the controller to capture shots remotely — perfect for shooting live video of your band or taking group photos. The remote is universally compatible with iOS 5.0 and above and can be operated up to 10 meters away from the device, perfect for capturing live performances, family vacation photos, movies and selfies. If you remove the iPhone holder grip from the iKlip Grip Pro, you’ll actually have two products: a standard UNC 1/4"-20 universal handle, monopod or tripod for small digital cameras and action video cameras, plus a secure grip iPhone holder that can be used on standard tripods. 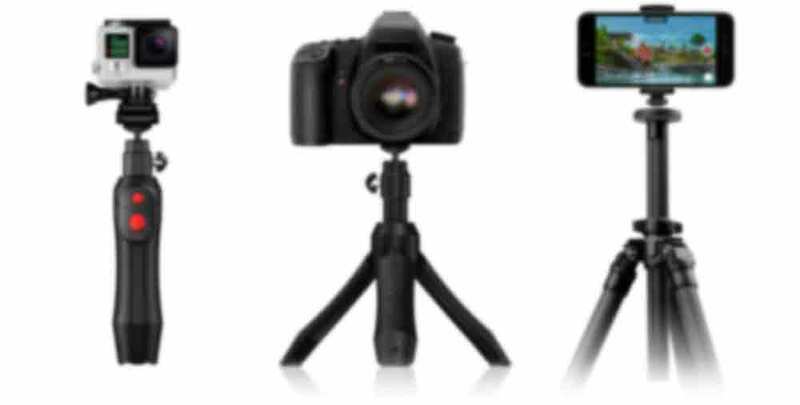 This is handy when you need a more professional tripod in demanding situations but still want to use your iPhone for capturing stills and video.